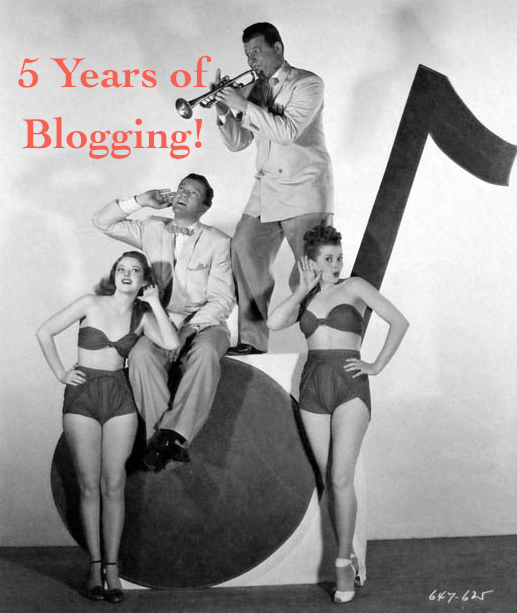 Celebrating 5 Years of Blogging! Sound the trumpets, it's been five years! This month marks the five year anniversary of Dear Old Hollywood. I can hardly believe that much time has already passed. This blog started with two purposes in mind: first, to share my interest in classic films and second, to keep track of various filming location discoveries. Now the blog has also become a way for me to continue learning about classic films and classic Hollywood from exchanges made with the interactive online classic movie fan community. During the last five years well over a million visitors have come to Dear Old Hollywood, a number that still amazes me. I've met some visitors to this blog - some in person, some electronically - and these connections have been one of the more rewarding parts about keeping up the blog. In the beginning I would update the site more frequently, but after becoming a new dad almost two years ago, time has become a precious commodity and I try my best to update the blog when I can. Like many bloggers, this blog is something I just do for fun as a hobby. I do have a full time studio job that keeps me very busy and now the adventures of parenting as well, so thanks to all of you who have stuck around and continue to check in every once in a while to see if I've updated the blog. Thanks again for reading. Here's hoping I can continue this for at least another 5 years!